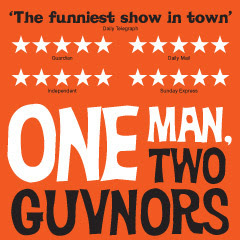 LOVE comedy? LOVEtheatre have the tickets for you! Fancy a laugh? LOVEtheatre rounds up the best selection of must-see comedy shows in London's West End. We guarantee to have your sides splitting with these hilarious nights of comedy. Look out for their great value deals! Meet the Packers – just your perfectly average, totally dysfunctional, ‘well-dodgy’ Essex crime family with a BIG problem. 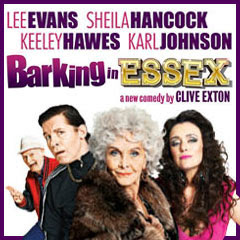 Catch Lee Evans, Sheila Hancock, Keeley Hawes, Karl Johnson and Montserrat Lombard before the police do in the world premiere of this uproariously funny play. Book great seats from £27.50 with a free glass of bubbly. 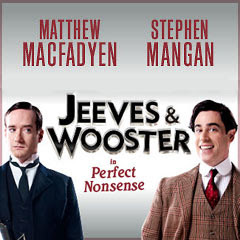 Join Stephen Mangan as the effervescent, aristocratic fool Bertie Wooster and Matthew Macfadyen as his dutiful valet, Jeeves for an evening of ‘Perfect Nonsense’ in the world premiere of a new stage play featuring P.G. Wodehouse’s iconic double act. Best seats are available for this eagerly anticipated production. Richard Bean’s award-winning play is a glorious celebration of British comedy – a unique, laugh-out-loud mix of satire, songs, slapstick and glittering one-liners. Save up to 39% on top price tickets for a limited time including Friday evenings. The Tony Award winning Broadway phenomenon from 'South Park' creators Trey Parker and Matt Stone is now London's hottest musical. Bertolt Brecht's funny, sharp and thrilling take on the rise of Hitler told with razor sharp wit. Stars Henry Goodman. Alan Ayckbourn's wonderfully funny & charmingly English comedy returns to the West End starring Felicity Kendal and Kara Tointon. The story of the stripping Sheffield steelworkers is back live on stage featuring all of the much-loved songs from the movie. An all-star cast feature in this laugh-out-loud adaptation of the classic Ealing comedy by Father Ted creator Graham Linehan. The all new West End production of the award-winning musical tells the legendary tale of King Arthur and the Knights of the Round Table.